Customer reference programs are one of the most powerful tools in the B2B marketing toolkit. Whether you call them success stories, testimonials, reference stories, or advocate marketing, these profiles of your customers and their experiences with your company and product are extremely influential. For your prospects, your customer references offer the highest possible degree of authenticity and credibility. It’s not that your website or brochures lack credibility. Not a bit - they provide necessary information and direction. But the third-party validation offered by a customer reference has a far greater impact when it comes to influencing the behavior of your prospective customers. For many organizations, however, launching a customer reference program can be a challenge. It’s not good for anyone’s reputation – yours or your customers – to be involved in a customer reference program that fails to gain momentum. A single lonely reference case on your website can start to look stale pretty fast. So how do you successfully launch a program that will last for the long term? Your organization. You’ll need full support from sales and marketing. Without the support of sales, in particular, your program will never see liftoff. Clearly communicate the metrics and the objectives of the program and communicate the rules of engagement from the beginning. Your partners. If you sell your product through a network of business partners, you’ll need to highlight the advantages that they will derive from participating, in order to get them on board. Educate them on the benefits that they can exploit – the boost to their profile, how they can use the reference cases in their own marketing programs, how they can strengthen relationships with their customers, and so on. Your customers. Customers like to participate in reference programs. It positions them as industry leaders, and offers visibility for their business. But they’ll only want to participate if they know your program is active, properly supported and professional in all aspects. 2) Set up a customer reference recruitment process that is smooth, well-managed and provides constant, clear and up-to-date reporting on the current status of all outreach. Whether you manage it in-house or with a partner, it’s vitally important to run your customer reference program professionally. You’ll quickly lose any launch momentum if your program looks like it’s being managed part-time. Want to learn more about how to successfully launch a customer reference program? 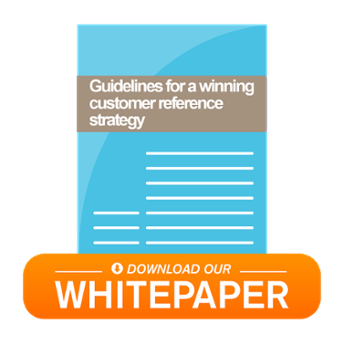 Download our white paper, ‘Guidelines for a winning customer reference program,’ here. This white paper offers a step-by-step guide to starting up a program, including how to measure the success of your program, and other helpful tips and suggestions. Need additional help with your Customer Reference Program launch? Living Stone takes care of the logistical, editorial, outbound and measurement tracking for your reference marketing program, whether it is regional, national or international. We organize teams to visit your customers anywhere in the world – our global network of writers, local photographers and camera crews are experienced, professional and adhere to our quality standards. Fast and affordable !